You'll discover tucked-away gems like Praia Ponta de Mangue and Igreja Velha de Sao Pedro. You'll find plenty of places to visit near Porto de Galinhas: Zoologico Pet Silvestre (in Maragogi), Piscinas Naturais de Barra Grande (in Barra Grande) and Tamandare (Nova Matriz de Sao Pedro & Carneiros Beach). 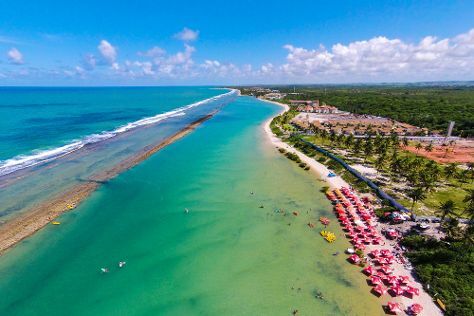 The adventure continues: tour the pleasant surroundings at Muro Alto Beach, enjoy the sand and surf at Japaratinga Beach, identify plant and animal life at Natural Pools of Porto de Galinhas, and contemplate the long history of Gaipio Sugar Cane Mill. Before you visit Porto de Galinhas, use our trip planner to discover what you can do and see there. In June, daily temperatures in Porto de Galinhas can reach 32°C, while at night they dip to 26°C. Wrap up your sightseeing on the 24th (Mon) to allow time to travel back home.